If you found out that you only had 40 days left to live, what would you do with that time? You might begin with making a bucket list. A bucket list is a list of things you want to accomplish before you “kick the bucket”; in other words, before you die. 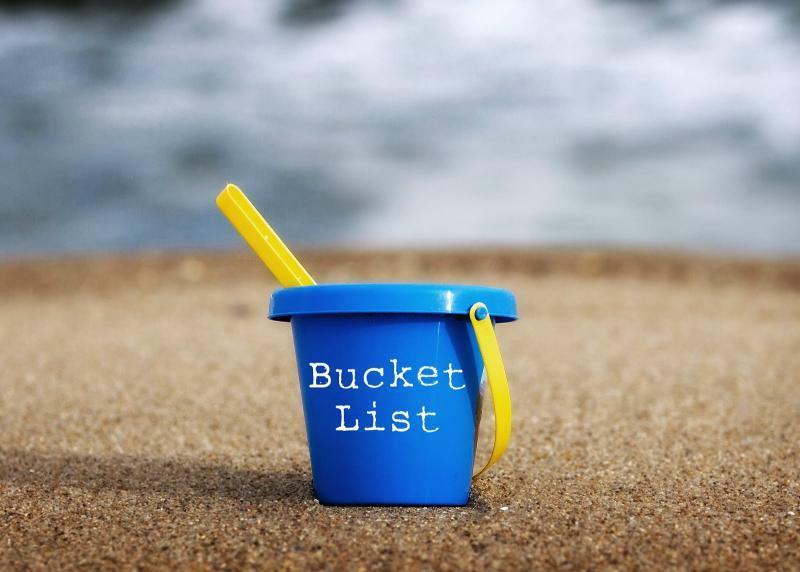 What would you put on your Bucket List? Before we begin making our list, we need the right perspective. None of us knows how much time we have left. Mostly, we live as though we have all the time in the world. We forget our frailty and God’s sovereignty in all of life’s plans. James gives us a proper perspective about life. Isn’t it ironic that as soon as we begin our careers after school, we start retirement planning? We study hard to get an education so we can get a job. After we get the job, we plan to retire. We put part of our salary into a retirement account and make big plans about things we want to do during retirement. When retirement finally comes, we find we are unable do those things and spend our money on medical bills. There must be something more to life than this. There is. All of us, regardless of our age or career, should engage in expiration planning rather than retirement planning. We are not guaranteed a retirement and we don’t like to think about it, but we can’t avoid our expiration date. We need to quit considering our death as “unthinkable” and realize it is “inevitable.” We need to prepare for our expiration, which could come at any moment, and not waste our time before it comes. Ps 39:4-6 Show me, O LORD, my life's end and the number of my days; let me know how fleeting is my life. You have made my days a mere handbreadth; the span of my years is as nothing before you. Each man's life is but a breath. Man is a mere phantom as he goes to and fro: He bustles about, but only in vain; he heaps up wealth, not knowing who will get it. David prayed this because he recognized that when we are mindful of the shortness of our lifespan, especially in light of eternity, it changes our perspective about what we are doing here on earth in the time that we have. The important things we keep putting off, that we keep saying we will do to eventually, the changes we hope to make, we realize there isn’t that much time to do them. Therefore, we need to prioritize what is really important. Let me give you an illustration with a bucket, rocks, and sand. Let’s say the rocks illustrate our priorities, our bucket list, and the bucket represents our life. The sand represents all of the other things in life that we have to do. What happens if we put the sand in the bucket first? We can’t put the rocks in can we? Our priorities get crowded out. However, if we put the rocks in the bucket first, the sand filters around the rocks. They fill in the cracks or the time we have left after our priorities are accomplished. Therefore, we should ask, “what does God want me do to do with my life”, because if we don’t do what God wants, we are sinning by being our own god. After all, God knows the future, He knows what really we need, and He has a purpose for our life. It makes lots of sense to let God determine our bucket list. Furthermore, His bucket list for us is bigger and more exciting than we can imagine. Don’t be afraid to let God determine your future, and don’t limit yourself or God. After all, Phil 4:13 I can do everything through him who gives me strength. Through Christ, God gives us the power to tackle God-sized dreams. If the Holy Spirit tells us in His Word to do something, then God will give us the strength, the ability, and the means to do it. However, don’t live so much in the future that you miss God’s plan and blessings for today. You say you don’t know what God wants you to do? Jesus said the two most important things we can do here on earth are to love God and love others. If we make these our priorities, the rest will fall into its proper place. It is our relationships, first with God and then with others, which we will be judged by when we meet God face to face. God created us for relationships, but we often fail to give these the same priority God does. Our tendency is either to avoid relationships, not having very many close friendships, or have superficial relationships where we don’t reveal anything about ourselves. We talk about the weather, sports, the latest news, but nothing about what’s really going on inside us or in our lives. These aren’t really relationships or friendships, but acquaintances. Investing in relationships will cost us time and perhaps money, too. There is a passage of Scripture, where Jesus was teaching about money, and he makes a curious statement. As followers of Jesus, we are to use all our gifts and resources to help others and make friends for the purpose of bringing them closer to Christ. This earthly investment will have eternal rewards. We invest in others, even sometimes at a personal sacrifice, for their benefit. That is what love does. That is what Jesus did for us. In fact, He gave His entire life for us. Jesus called his disciples friends because He shared with them everything His heavenly Father revealed to him. As a friend, He spoke God’s truth in love. A true friend isn’t someone who just engages in small talk about football, or the latest news, or the weather, or tells us what we want to hear. A true friend is someone who invests in our life but also tells the truth in love from God’s perspective. If we really care about someone, shouldn’t we share the truth with them? Shouldn’t we share God’s good news, even if it may not be what they want to hear at the time? Life is short and they need to plan for their expiration, too. Love will motivate us to share Jesus with them. None of us knows the day or the hour when we will be called to stand before the Lord. So don’t delay sharing the truth in love. 1 Pet 4:7-10 The end of all things is near. Therefore, be clear minded and self-controlled so that you can pray. Above all, love each other deeply, because love covers over a multitude of sins. Offer hospitality to one another without grumbling. Each of you should use whatever gift you have received to serve others, as faithful stewards of God’s grace in its various forms. Peter says that because time is of the essence we ought to be “alert and sober minded.” To be “alert” means to be aware. To recognize what’s going on around you. Someone, who is alert, is ready to respond to the Holy Spirit’s “whisper” at a moment’s notice. Then Peter says we are to be sober minded. This means to be in control of our thoughts and not susceptible to irrational thought, confusion, and fantasies. In other words, to be sober minded is to accept the Word of God as being reality, to believe in the truths it reveals, and to live it out in our life. Living it out means loving each other deeply from our heart and showing that love by serving with the gifts God has given us. Furthermore, we are to be alert and sober minded so that we might pray! Every saint, regardless of age or physical condition, can and should pray. Prayer accomplishes things. Prayer is one of the most important things we can do for ourselves, others, and for God. Prayer is relating to God. 1 Pet 5:7-8 Cast all your anxiety on him because he cares for you. Be self-controlled and alert. Your enemy the devil prowls around like a roaring lion looking for someone to devour. Prayer is also our defense and offense against satan. We have an enemy who tempts us with the world and distracts us with anxiety. If he can succeed at that and keep us from prayer, we will not be fighting against him; we won’t notice the evil around us; we will live to please our fleshly desires; and we will serve satan. Therefore, add constant prayer to your bucket list and begin today. Eph 5:15-16 Be very careful, then, how you live-- not as unwise but as wise, making the most of every opportunity, because the days are evil. Brothers and sisters, if you get nothing else out of this message this morning, please get this and take it to heart: Jesus did not die just so we could run an event called, “Church,” on Sunday mornings. What God has done through Jesus is meant to have a far deeper impact, a far greater influence, in our lives and in the world than what takes place in this building here. As important as it is for us to gather together and worship with one another, Jesus died and rose again, and called us to be His, for something much greater than this. If the doors of this church are where your faith begins and ends – you’ve completely missed the will of God! We are to be Christ’s ambassadors to this world 24/7. God has given all of us a limited amount of time. We will be called to give an account of ourselves before a holy God for how we invested our gift of time. This is not about salvation – this has to do with the ministry that God entrusted to us. Remember Jesus’ commission to us? Furthermore, Col 3:23-24 Whatever you do, work at it with all your heart, as working for the Lord, not for men, since you know that you will receive an inheritance from the Lord as a reward. It is the Lord Christ you are serving. Make sure your bucket list is from God. Whatever is on our bucket list, do it as for the Lord, so that in all things God may be praised through Jesus Christ. Whatever we do should bring glory and praise to God; point people to Jesus, reveal His love, His grace, His mercy, His power, so others may know Him and become His disciple. Currently, there is a lot in the news about gun rights. I read story of a woman who finished shopping and went to get into her car. But when she did, she found four men inside the car. She dropped her shopping bags, drew a handgun, and screamed, “I have a gun, and I know how to use it! Get out of the car!” The men bolted from the car and ran like crazy. The woman was still shaking as she placed her groceries in the car and then got in to drive home. But no matter how she tried, she could not get her key into the ignition. It suddenly dawned on her—this was not her car. It looked like hers, but hers was parked four spaces away! She took her grocery bags and put them into her own car, and then drove to the police station to report what she had done. The desk sergeant to whom she told the story nearly fell off his chair laughing. He pointed to the other end of the counter, where four men were reporting a car-jacking by a wild woman carrying a large handgun. Here is the lesson. She thought it was her car, and she had a right to do what she did to the men who were in it, but she had the wrong perspective. The car belonged to someone else. Likewise, we have the wrong perspective. We mistakenly think this world belongs to us and we can do what we want with the people in it. But this world and the people in it belong to God. We also belong to God, and He appointed us as managers and stewards with great responsibilities until Jesus returns. It is important to be faithful and not forgetful of these important truths. Remember who you are. Remember whose you are! Our life is but a mist, but God has a purpose for us. Yesterday is gone, tomorrow may never come, all we have is today to love and serve Jesus. All we have is today to love and serve others. Do you have an expiration plan? Remember I asked you what you would do if you were told you only had 40 days to live? God told the evil people of Nineveh they only had 40 days left before He destroyed them. Here is how they spent their time. In other words: time and repentance are of the essence. There are a lot things that we can put off until tomorrow and it’s no big deal. They are like the sand. Moreover, there are a great many more things that aren’t worth spending our time on them at all. But there are some things in life that are too important to put off even for one day. There are some things that shouldn’t wait for tomorrow, because for you, or for someone close to you, tomorrow might never come. One of those things we should not put off is making Jesus our Lord and Savior by repenting of our sin and confessing Jesus as the Christ, the Son of God. Maybe you have never considered God in your plans. Today, you have time to change that. No matter how sinfully you have lived to this point, God will redeem your past through Jesus Christ and give you a blessed future. Don’t delay making Jesus your Lord through repentance and giving Him your life in baptism. Not many of us get a warning of how many days we have left to live. Today could be our last. We need to be prepared to face Jesus Christ. It is better to face Him now in repentance than to face Him in judgment.